This lower-carb dinner has gotta happen in your kitchens my fine folks! 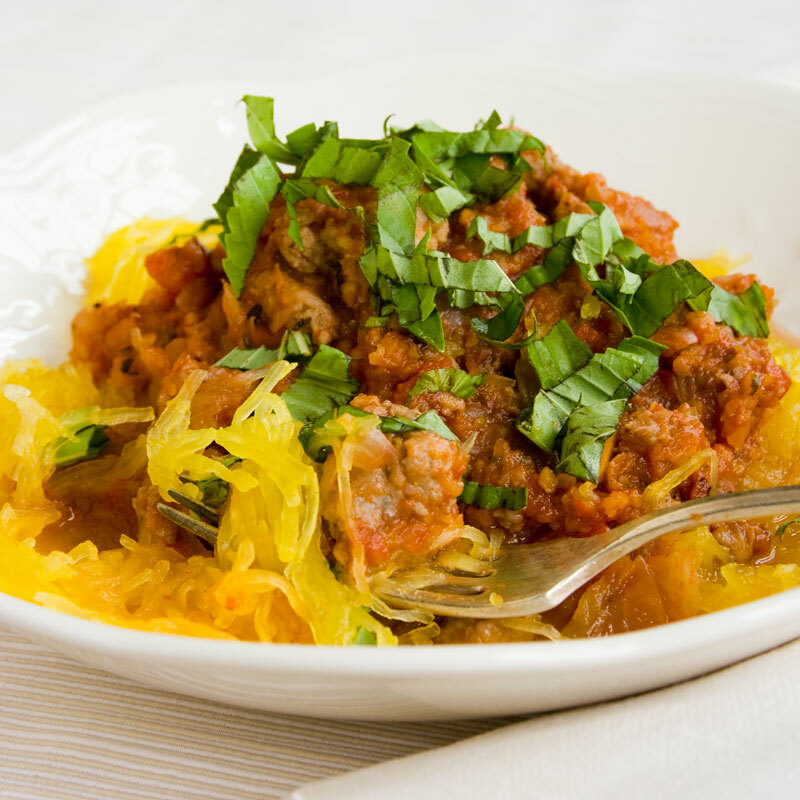 It’s Spaghetti Squash with Turkey Sausage Ragu made with tons of veggies! It is ready in just 50 minutes and is gluten free. I originally shared this recipe on October 24, 2011. I have updated the images and some of the text today. 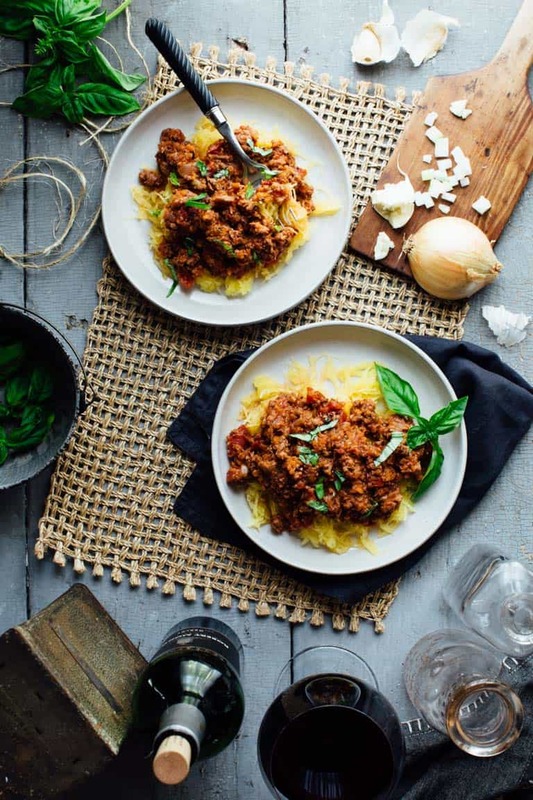 Spaghetti Squash is one of those vegetables that seems a little daunting to the uninitiated. From the outside, one would be hard pressed to guess how this sunny-yellow winter squash is transformed into tender spaghetti-like stands. The truth is, though, it requires very little effort. Just halve the squash, scoop out the seeds and the oven does the rest. You can even microwave it! 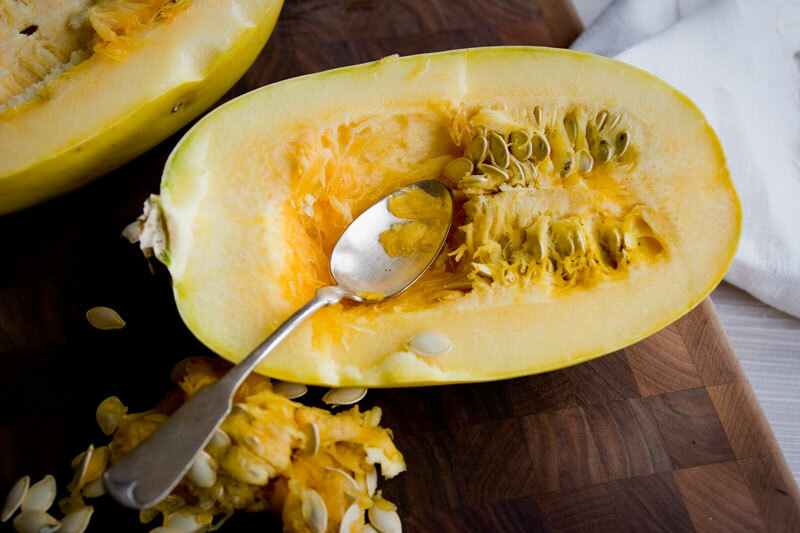 When it is done, the golden flesh will come apart into the “noodles” responsible for giving the squash its name. 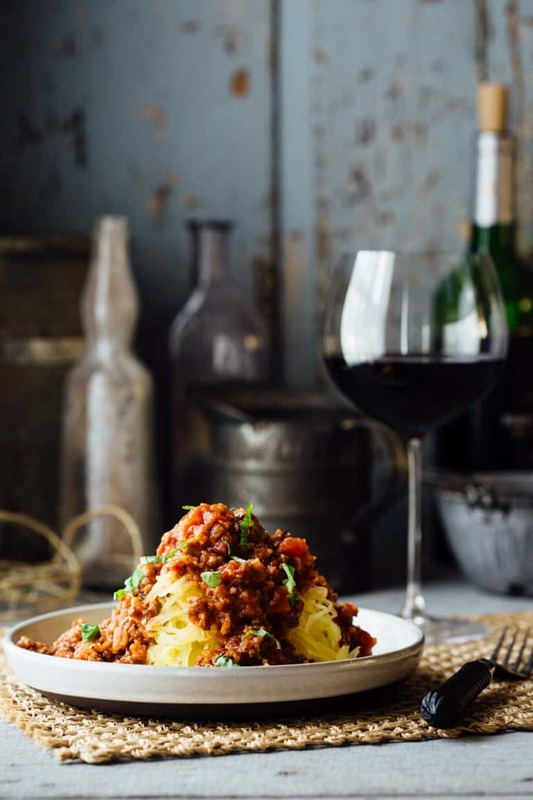 Tossed with extra-virgin olive oil, a little asiago cheese and chopped fresh herbs, spaghetti squash makes a yummy cold-weather side dish. Or it can be used as a stand in for wheat pasta for a low-carb entrée. Here I’ve paired it with Turkey Sausage Ragu. It is inspired by this tried and true Healthy American Chop Suey sauce but I’ve used ultra-lean turkey sausage and adjusted the seasoning a bit. 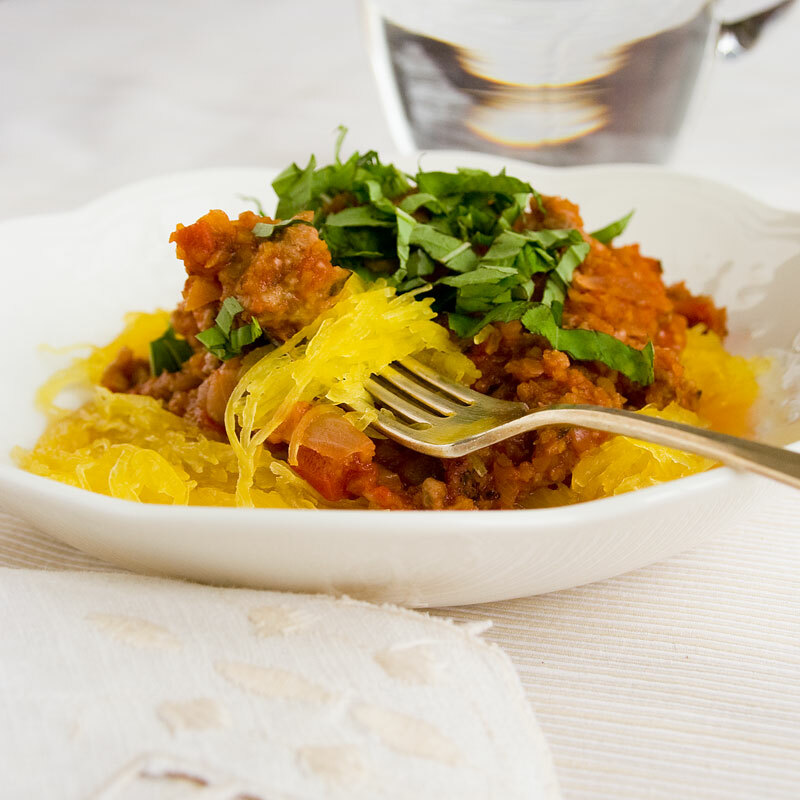 Using spaghetti squash in place of pasta will count toward your daily vegetable servings. That’s enough reason to love it, considering we should be striving for nine servings of fruits and vegetables a day. 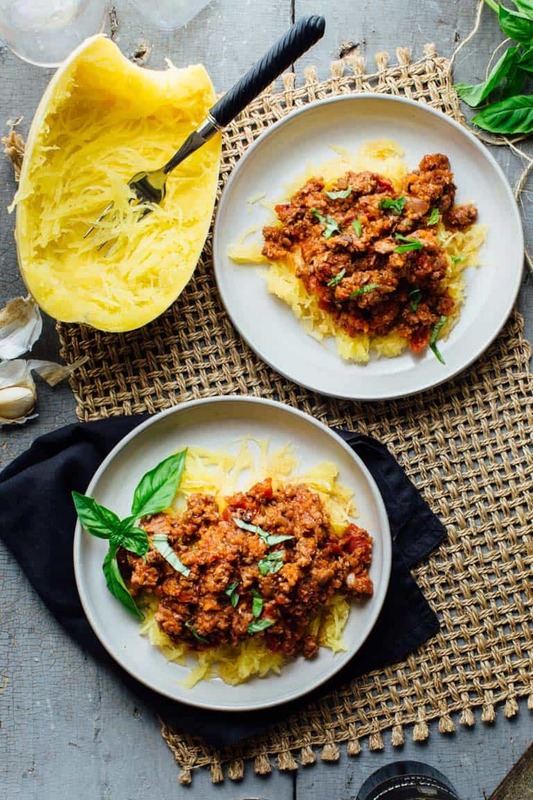 Spaghetti squash has about one quarter of the calories of wheat spaghetti. It has and only 7 grams of Carbohydrate and 1.5 grams of fiber which means it has 5.5 net carbs per cup! It has a very low glycemic load, which may help keep your blood sugar in check. Friends, thank you so much for stopping by today! I really appreciate it. Make sure to leave a comment below and let me know if you try this recipe. Or just to say hi! I love hearing from you! I also have an easy rating button too, so just click the stars if you don’t have time to write a full review. Also visit me over on instagram and tag me @healthyseasonal too! This lower-carb dinner is loaded with veggies! 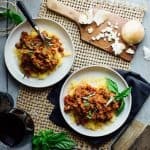 Pile this Turkey Sausage Ragu over the cooked spaghetti squash for a lower-carb comfort food meal. Cut spaghetti squash in half lengthwise. Scoop the seeds out with a spoon. Lay squash, cut-side-down in a 9 by 11-inch baking dish. Pour the boiling water in the dish and cover tightly with foil. Carefully transfer to the oven. Bake 40 to 45 minutes until the squash is tender. To check if it is done, remove foil, carefully flip the squash over, and drag a fork over the flesh. If it is ready, the squash will pull away from the skin in tender strips. Scoop out into a bowl and gently “shred” apart with a fork if necessary. Alternatively, cook the squash in the microwave. Meanwhile, fit food processor with steel blade attachment, close lid and turn motor on. Drop garlic through feed spout and continue processing until the garlic is minced. Open lid and add carrot and celery. Process until the carrot and celery are finely chopped. Open lid, add onions and pulse until the onions are roughly chopped. Alternatively, use a knife to mince garlic, finely chop carrot and celery and dice onions. If turkey sausage is in links remove the casings by slicing along the length of each sausage and slipping the casing off. Heat oil in a large skillet over high heat. Crumble in sausage, and cook, stirring and breaking up chunks of meat until browned, 4 to 5 minutes. Stir in the vegetable mixture, Italian seasoning, salt and pepper and cook, stirring occasionally until the vegetables are cooked down and browned slightly, 8 to 12 minutes. Pour in wine and cook until mostly evaporated, 2 to 3 minutes. Stir in tomato and bring to a simmer. Reduce heat to maintain simmer and cook, stirring occasionally until the vegetables are tender, about 5 minutes. Serve the ragu ladled over the squash, sprinkled with basil. *ingredient note: Turkey sausage can be surprisingly high in fat and a total sodium bomb, so check the label before buying. Check out Jennie O’s stats for their “lean” Italian Links: each serving has 10 grams of fat and 670mg of sodium. The one I like is made by Stonewood Farm from Orwell Vermont. It only has 2 grams of fat per serving, and 470 mg of sodium. If you can’t find a lower sodium option, just adjust down the added salt in the ragu. I love spaghetti squash! This recipe is absolutely perfect! I can’t get enough of it in the fall and winter! It one of my faves! Thanks so much for coming by Brandi. I only recently discovered spaghetti squash and I LOVE IT! It’s the best! And I know I would love it with this turkey sausage. I did not know you can make spaghetti squash in the microwave though – I’m intrigued! Hey Vicky, How are you? So nice to hear from you. Yes! OMG, love it! So glad you’ve found it too. Yes, it takes half the time in the microwave. So easy. I’ve been wanting to try and make squash spaghetti but I still haven’t got around to it. I love spiralised veg noodles, but this one is even easier as you don’t need to spiralise the squash! Oh man, then you definitely have to try it! You’ll love it! Love that you can use spaghetti squash as the ‘carb’. It tastes so good and love that you’ve made the sauce with fire roasted tomatoes. Ha ha, yes “carb” in quotes! lol! And heck yes about the Fire Roasted Tomatoes, they are my favorite. And I think they make a difference for sure! I keep walking away from spaghetti squash at the market, but it looks like I’ve just been incredibly insane to have overlooked so much goodness. Will pick one up next time. Ha ha. So true! It is a hidden gem!